John Force is an agent with the ASG. He is in fact considered that organization's top agent, able to do such remarkable things and achieve incredible results that he is known by all as their 'Magic Agent'. He earns the epithet through hard work, daring exploits, and having real magic to get his backside out of the trouble those exploits invariably get him into. ASG stands for the American Security Group, described as "top secret and all powerful" (the last one a tad unsettling) which has its headquarters in an unmarked office in the Pentagon. It is "composed of agents, experts sworn to risk their all in the service of their country." John Force is a man who looks in his mid 30s though that is deceiving. One of the tales in the first issue shows how he was sent in 1944 to aid Transylvanian guerillas against the Nazis and he looked around 25. Since the era in which the recorded adventures take place is 1962+, 19 years later, he would likely be in his 40s. Force is usually found dressed in a suit and tie and habitually wearing a long tan trenchcoat. He works from time to time with other ASG agents but he is the only one who seems to favor the coat. Black haired, he sports an eye patch over his left eye which he worn in his WWII adventure so he obviously suffered the eye loss earlier. Despite taking place in the 60s, a time when operatives sported all manner of hi-tech doodads, the agents of the ASG are old school and rely on their guns and fists. The one big exception is the invisible ink tattoo each member has on the back on their hand. When needed, a flashing symbol, the sign of ASG, appears sending a special message. The tattoo can radiate in different colors indicating the type of message coming in: green for help, blue to head to see "Mr. Big himself", red to call headquarters "fast". It can also be used by HQ or the agent himself to transmit Morse code to provide further data. Apparently the signals can get through anywhere in the world. By far the most important aspect to John Force and the real reason he is the Magic Agent is the thick gold medallion he keeps in his pocket, an object which looks to be slightly larger than a silver dollar. On one side of the object is a depiction of a Greek building fronted by four doric columns. Overlaid on each of these pillars is a word showing a different power: reading left to right they are Telepathy, Illusion, Hypnosis, Extra-Sensory Perception. Pressing a finger to one of these columns gives Force the ability specified, though how long it lasts is not known. 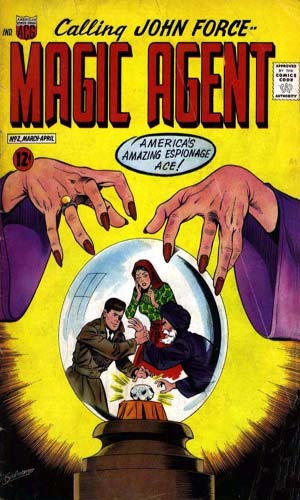 In a short tale in the first issue of the comic, the manner in which Force becomes the owner of the medallion is told. As the Allies prepare for D-Day during the Second World War, a concern was that Germany would transfer a large panzer division from the Balkans to France and stymy the invasion. To help keep the need for the forces in that area, Force is sent to Transylvania to help the partisans. When he is captured and inprisoned in a dungeon at Castle Cagliostro, held by the Nazis, in a daze he is visited by four ghostly apparitions. Nostradamus, Merlin, Cagliostro and Harry Houdini all appeared to join their abilities to create a talisman that Force could use to break free and then use in the name of freedom. Now, Nostradamus was said to have great ESP to see into the future. Merlin was a great magician and worker of awesome feats. Cagliostro was a noted mystic and magician. Houdini? One of the best escape artists and a terrific showman but as far as I have heard, not in possession of any special power. Nevertheless, Force will use this medallion many, many times over the next couple of decades in his fight to keep his country safe and secure. Some adventures Force would never have come close to succeeding if not for his medallion but other times it is good old fashioned spy craft aided with a smidgen of magic that gets him through. However, it is shown in one case when he loses the talisman for a while that it has become a much needed crutch for without it, he loses confidence quickly. Once he got it back, though, he was his old self even with the object stowed away. Found in John Force #1 - The dictator of Servania comes to the UN to speak but is really issuing an ultimatum to the US to get its troops out of Europe. Found in John Force #1 - The ambassador of Caronia was kidnapped a week before the signing of a friendship agreement with the US, a manuever to disrupt the good relations because an ID card of an ASG agent was found at the scene. John Force is told to crack the case. Found in John Force #2 - An influx of illegals into the country has caused the director of the ASG to be in hot water. John Force goes out to find who is sneaking the people in. Found in John Force #2 - A communist agent, Kralov, is planning attacks on the US guided missile facilities but he worries John Force will stop him so he goes after the head ASG agent first. Found in John Force #3 - The Secret Service is stymied as to who is passing the phony money and they ask ASG's top agent to look into it. 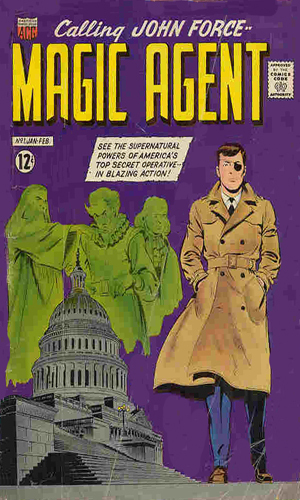 The adventures of John Force, Magic Agent came to the world through the services of the American Comic Group (ACG), a small company that produced a few titles but which never hit the big time. One of the magazines that came out was Forces' own title consisting of multiple stories about him in each one. This title would not last long, however, giving only 3 issues before disappearing taking Force with it. After the demise of that mag, John Force's adventures jumped around a bit. As postulated by Don Markstein*, the John Force stories that showed up in other comic books were possibly tales that would have been in the 4th issue of the original series had it survived. 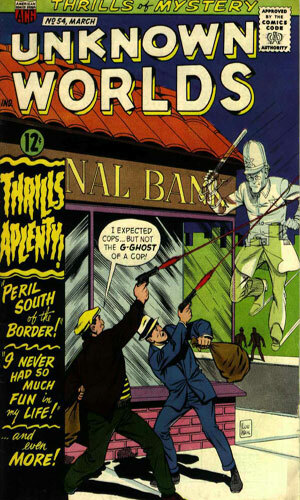 Two years after the last Magic Agent, another ACG title, Unknown Worlds #35 and #36, contained as part of its anthology style John Force adventures. Neither story was as long as the main ones in the original mag being 7 pages long instead of 12-13. 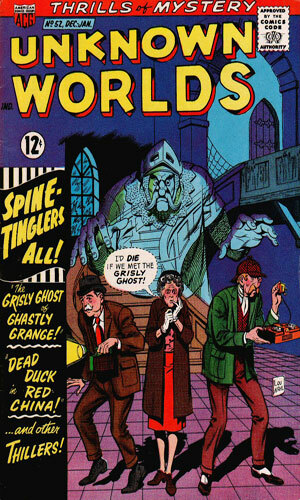 In the same month he was showing in #36 of UW, he was also having a go in a sister publication, Forbidden Worlds #124. 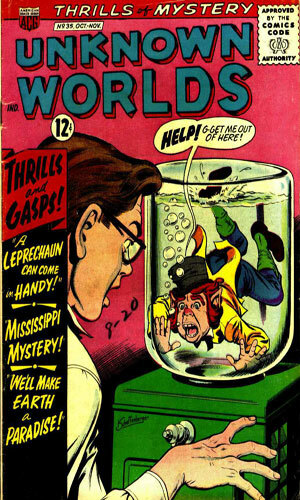 The next year it was in yet another title that he had a story, Adventures Into The Unknown #157. 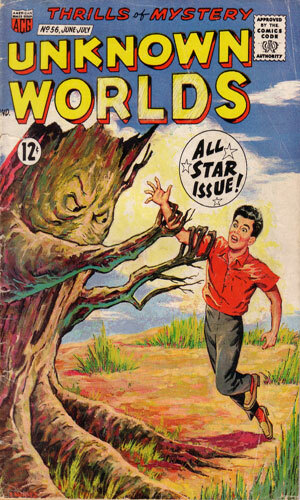 One year went by and Unknown Worlds again contained John Force tales in several of its issues (#48,#50,#52,#54, and #56). Some of these were of impressive length, going 11-14 pages each. Not bad for a second banana or filler. 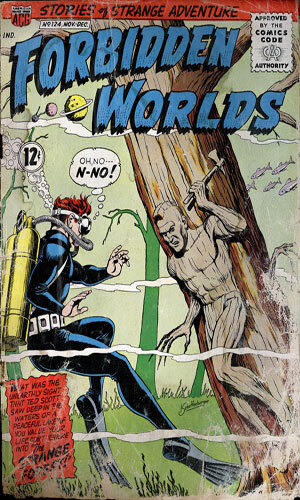 Two months after the last of the UW, John Force made his last appearance in Forbidden Worlds #145. Unless, of course, I missed one or two. That darned medallion of his makes following him tricky! * Much of this information was either obtained from or confirmed by the excellent website Don Markstein's Toonopedia, a fantastic site and place to spend a lot of long visits. John Force, Magic Agent - 13 pages - An anti-gravitational device is stolen from a remote secret facility and the President calls upon John Force to find and retrieve it. D-Day, H-Hour! - 7 pages - A tale from 1944 and the days leading up to D-Day, telling how John Force played an important role working with the Resistance in Transylvania to keep a Panzer division tied down. It also tells how John Force came into possession of the magic talisman. The Cougar Strikes - 6 pages - An impressive bank heist in Baronia by communist rebels resulted in the theft of millions planned to be used in their cause. John Force is teamed with other ASG agents to get the booty back. Missing One Ruby - 12 pages - The visiting ruler of the Indian principality of Varnath is in town to sign an oil agreement but her main opponent,Mahatma Regor, wants to stop her. To do so he plans to steal her prized Ruby of Varnath without which she loses her right to rule. Mr. X Marks the Spot - 5 pages - South American leaders have been the target of the Hatchetman, an assassin that John Force is directed to apprehend. Legion of Darkness - 9 pages - The small European country of Balkania is voting to decide whether to "become a red satellite or remain in the democratic camp". The most trusted man in that country, Dr. Novotry, can sway the voters but he is kidnapped and replaced by a member of the ancient group, Ona Laka. Soldier Without A Gun - 12 pages - John Force's success record attracts the attention of a foreign agent, Dr. Petrov, who kidnaps him and uses hypnosis to gain the secret and then the medallion, leaving Force powerless. The King Is Dead! - 5 pages - The king of Rodania is much loved by his people but the head of his secret police wants him dead. Beware of the Black Brigade - 9 pages - The thugs of the Black Brigade are spreading across Europe using a protection racket to pay for their expansion. To infiltrate their headquarters, John Force uses a mad scientist's shrinking 2D ray machine to become 6" tall. From Unknown Worlds #35 - 7 pages - An infamous spy, Rudolf Mayer, died in a run-in with John Force. Force was left wondering what he was doing in the US heading to join up with an acting troupe in a Mississippi steamboat. 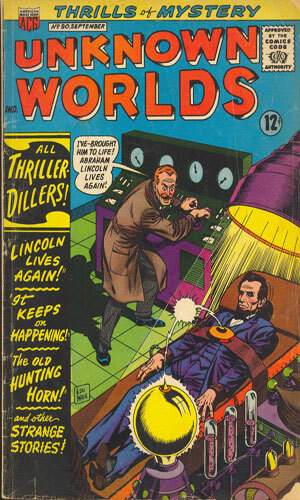 From Unknown Worlds #36 - 7 pages - A man considered the greatest American spy during WWII had great achievements until he ran afoul of a German doctor who tortured him. The doctor was later tried and executed but now the spy shows up at John Force's door shot and claiming the dead man was still around. From Forbidden Worlds #124 - 7 pages - The Soviets have created an atomic ray device capable of melting the Arctic ice. They used it to destroy an American base investigating large deposits of oil beneath the Alaskan surface. John Force is picked to investigate. 7 Guard This Man With Your Life! 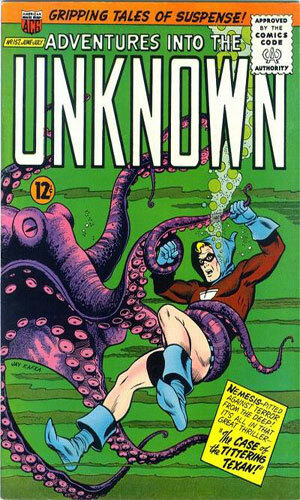 From Adventures Into The Unknown #157 - 7 pages - I do not have this one so plot is unknown. 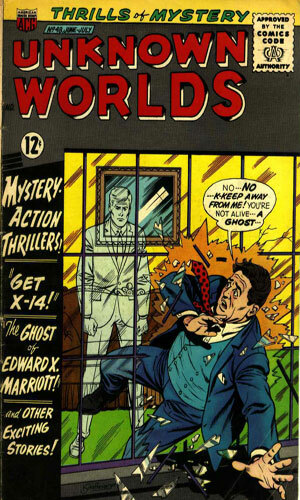 From Unknown Worlds #48 - 12 pages - X-14 was the codename of one of the greatest spies and saboteurs to plague the US. John Force goes after him but he feels the best way to catch him is to make himself the bait. 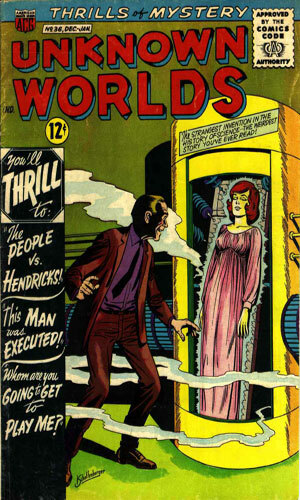 From Unknown Worlds #50 - 13 pages - A scientist has revealed his invention that can bring the dead back to life. He uses it on a Senator who had just died during a speech. Then he uses it to bring back Abe Lincoln. And Lincoln tells everyone to become a Communist! From Unknown Worlds #52 - 14 pages - The leader of the small country of Sandru, lying between Red China and India, is ruled by the Green Lama, a beloved man of peace. When a warlord back by the communists kidnap the Lama, John Force is sent to free him. 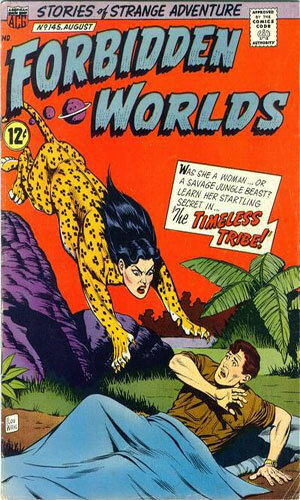 From Unknown Worlds #54 - 11 pages - A noted spy for the other side, known to be dead, is spotted in Mexico. John Force heads there to find the truth but he then finds a whole lot more. From Unknown Worlds #56 - 9 pages - An agent is found floating on a raft off of Key West, in a coma. John Force uses his medallion to learn from him that the Cubans are working on a nerve gas that could bring the US to its knees. From Forbidden Worlds #145 - 5 pages - A hot-shot PI tries to get a job with the ASG and the director relates a recent tale of John Force as the Magic Agent risks his life to stop a foreign agent sneaking in deadly microbes. It was an interesting twist to the spy game to have an agent using magic to get the job done but in truth it was not magic so much as really outré spy gadgets like Bond would use. And magic did not play much of a part in the stories other than as his tools of the trade. No one else had powers, good or bad. No one else called upon anything supernatural at all, even Force. In fact, at one point when Force has to investigate a supposedly haunted house, he claims boldly and forthrightly that he does not "believe in ghosts". Odd that it was four ghostly dudes that handed him the medallion while he was in a German prison. Of course that was nearly twenty years before so maybe it slipped his mind. The telepathy angle is played well. The extra-sensory perception is cool and not overly done. The hypnosis is very well handled and used intelligently. The illusion, though, was way over the top and just plain goofy sometimes. Making someone or some animal see a tiger to scare them - got it. Making a bunch of people see tanks coming over the hill - way too much! But the stories are fun and so I cut John Force some slack. Or maybe I just imagined I read about fake tanks. 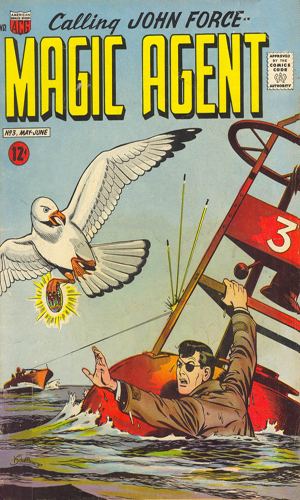 Or maybe the Magic Agent hypnotized me. Yeah, I'll go with that.